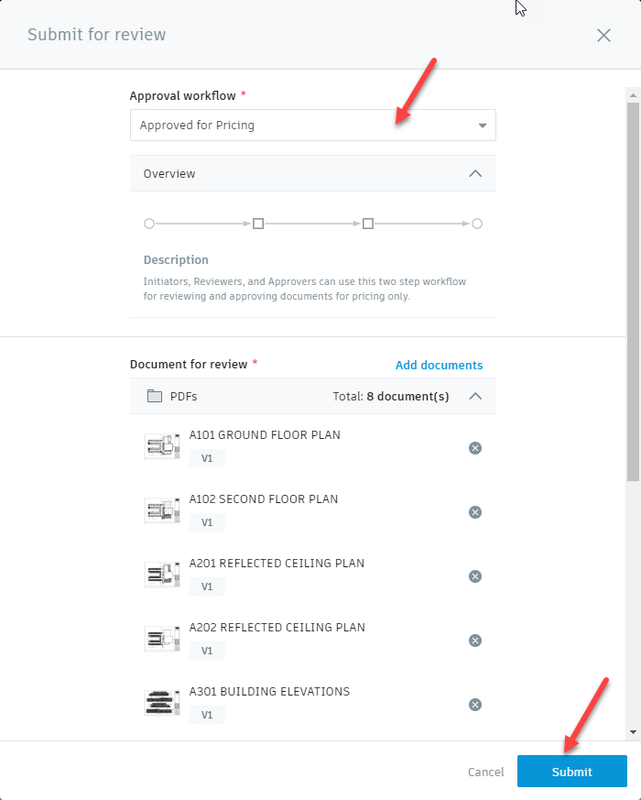 Recently, Autodesk released a new design workflow update to BIM 360 Docs. Document Managers within a project can now facilitate, control, and automate the distribution of project drawings, models, and documents. 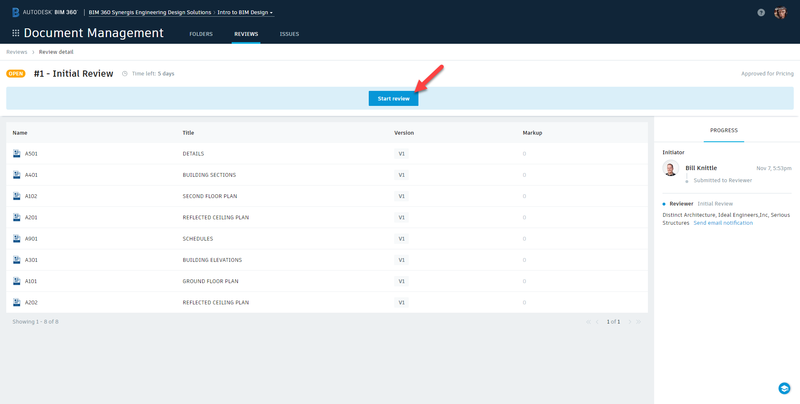 Additionally, project members can now review, markup, comment, and approve documents within the desired workflow. Project Admins begin by accessing the Reviews tab in the Document Management service of the Project Admin module. 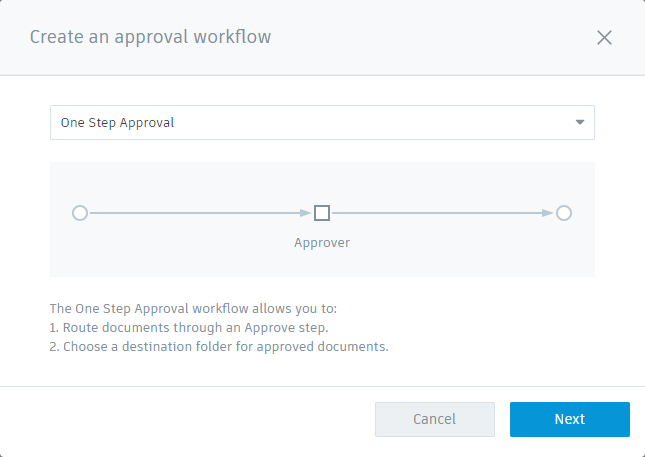 To create a workflow, the Project Admin simply selects the “Create approval workflow” button. At which point, a One Step, Two Step, or Three Step template can be selected in order to create the desired workflow. The One Step process allows documents to be routed through a single approval. Following approval, the document can remain in its current folder or be saved to a destination folder. For example, you may have your documents currently in a “WIP” folder but following approval, you wish to have them saved to an “Approved for Pricing” folder. The Two Step process allows documents to be routed through a single review step followed by an approval step. Similar to the One Step process, approved documents can remain in the current folder or saved to a destination folder. The Three Step process allows documents to be routed through two review steps followed by an approval step. Again, approved documents can remain in the current folder or saved to a destination folder. Once a template has been selected, the next step is to fill out the particulars of the process. First and foremost, the approval workflow needs a Name. The name wants to be indicative of the reason for the review. If necessary, a more explicit explanation can be entered in the Description field. The next step is to assign project members as the Initiators, Reviewers, and Approvers. Participants can be assigned by either User, Role, and/or Company. The Reviewers and Approvers will need to be given a space of time to conduct their reviews. The final step is to set up the Document approval status. Here, the creator can use the templated status for each value and add additional ones. Associated with each value is the option to enter Approval status labels and Icons. Following that step, is the Action upon completion setting. Here, an approved document can be copied to a selected folder when any document or all documents are approved. The default setting is No action. 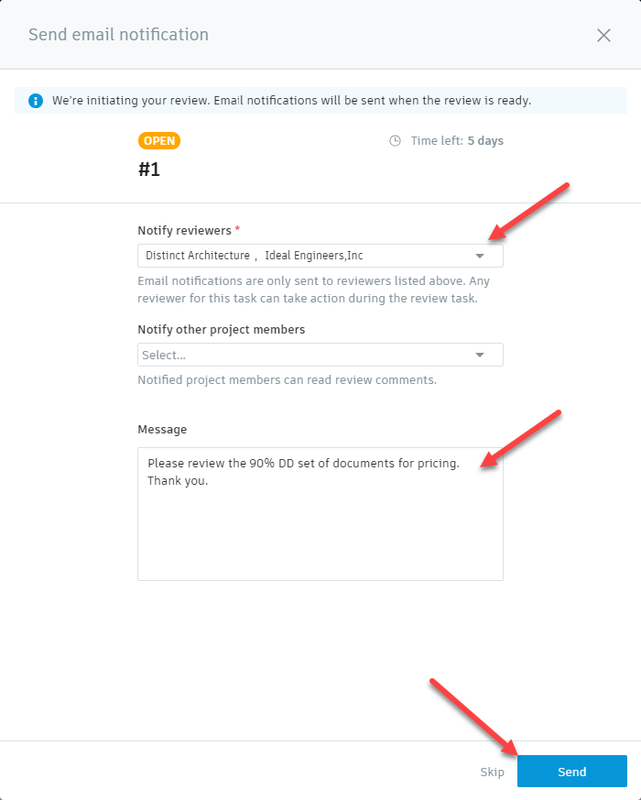 If necessary, the Custom note field can be filled out with a custom note or disclaimer visible to all reviewers on the Review detail page. With all the settings established, the Project Admin can save the workflow. If necessary, additional workflows can be created to meet other document management needs. 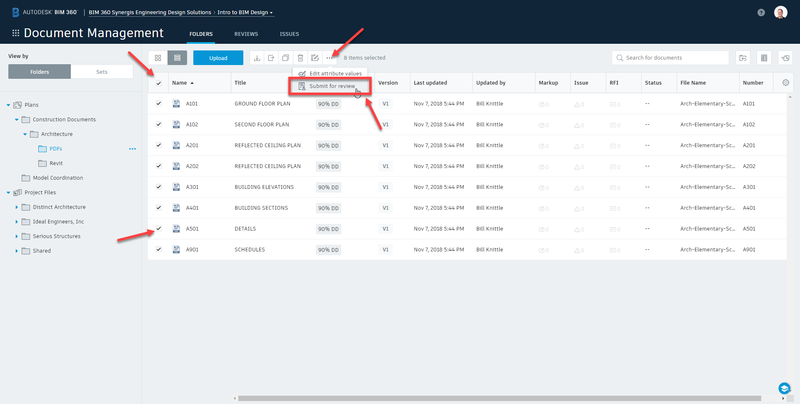 Existing workflows can be Configured, Duplicated, or Deactivated by the Project Admin. To utilize the workflow as it is established, the assigned Initiator(s) must submit the document or documents for review. 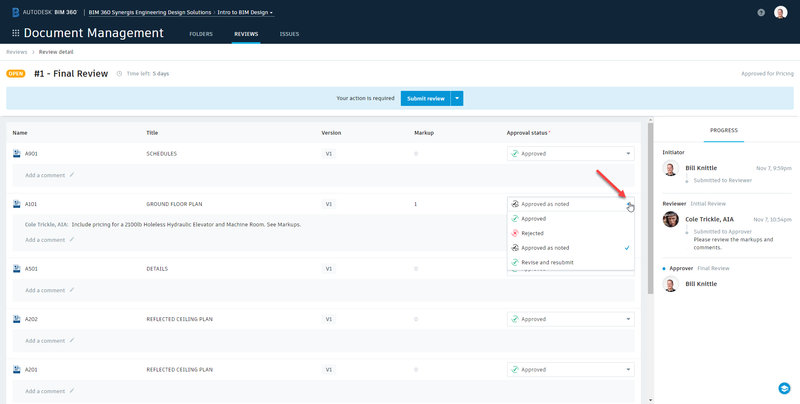 By selecting one or more documents in a series, the Initiator can select the More Actions button to access the Submit for review command. 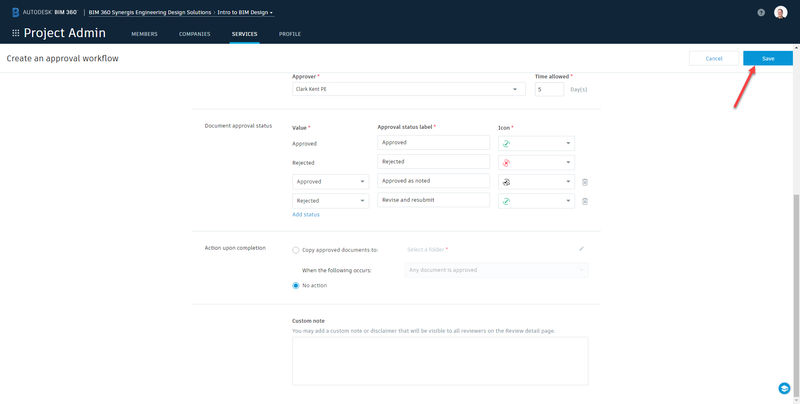 The Submit for review window will appear allowing the Initiator to choose the desired workflow to assign to the document or documents. Selecting the Submit button launches the Send email notification window. 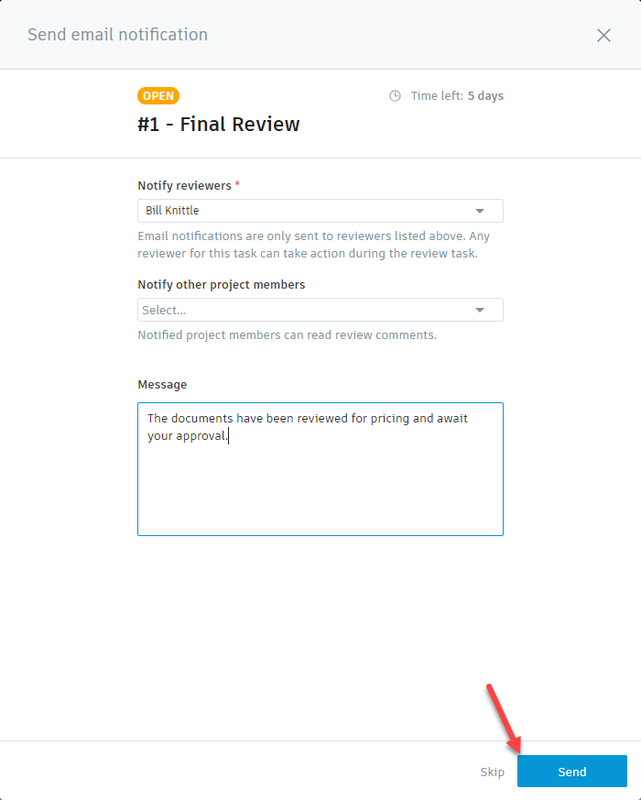 In the Send email notification window, the Initiator can select one or more of the designated Reviewers to review the document or documents. Additionally, a message can be added for clarity. When ready, the Initiator selects the Send button. The Reviews tab in the Document Management module provides a log of Reviews in the project. The review conveys various key pieces of information regarding the workflow. 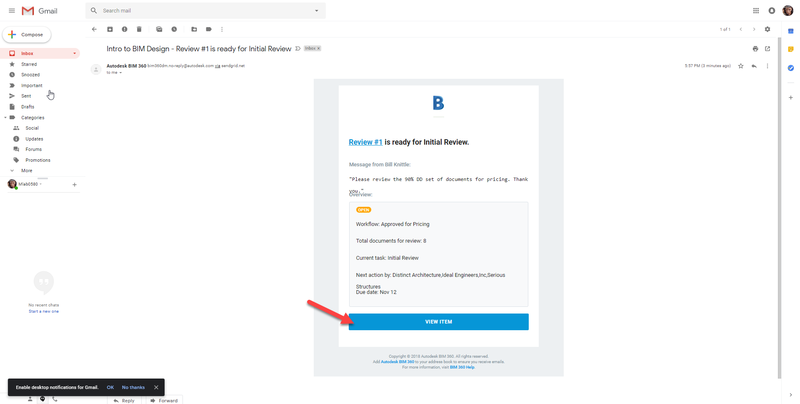 The recipient of the email notification can click on a hyperlink to launch the review in BIM 360. Once logged into BIM 360, the Reviews tab launches to the item for review. As the initial reviewer, an alert will notify the project member that the task is assigned to them. In order for others to review the documents, the task must be released. Selecting Start review will begin the task. 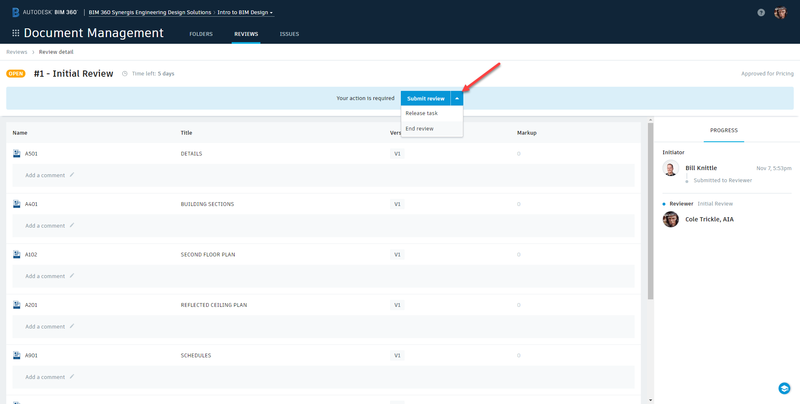 To release the task, the initial reviewer can select the Your action is required menu. 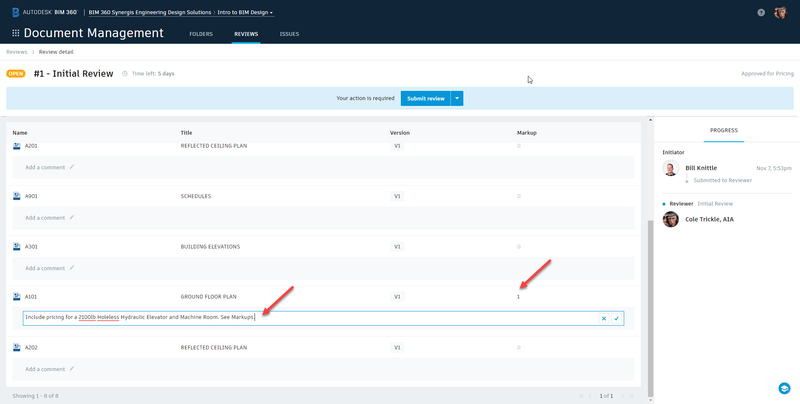 The Reviewer can select a document to make Markups using the standard Markup Tools as well as, add comments to the document. Selecting a document opens the viewer and viewer toolbar. The document under review will display the number of markups, as well as the comments on the Review page. 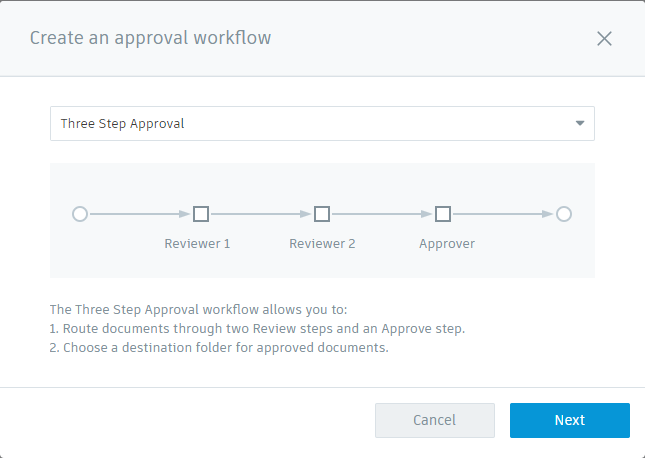 Following the review, the Reviewer can Submit review from the Your action is required menu to allow the Approver to finalize the workflow. Release Task will allow the current Reviewer to relinquish the step to other Reviewers. End Review will stop the workflow and void it. This will launch another Submit review window. Here, the Reviewer can conclude their review to submit the document or documents to the Approver. After the Reviewer selects the Submit button, the Send email notification window launches. Here, the Reviewer can submit the document or documents for final review. An email is immediately sent to the Approver in the workflow. It is at this point that the Approver starts their review. The Approver can add their own Markups and Comments if necessary. Ultimately, the Approver sets the Approval status for the document or documents. Finally, the Approver selects Submit review. This launches the Submit review window for the final time. 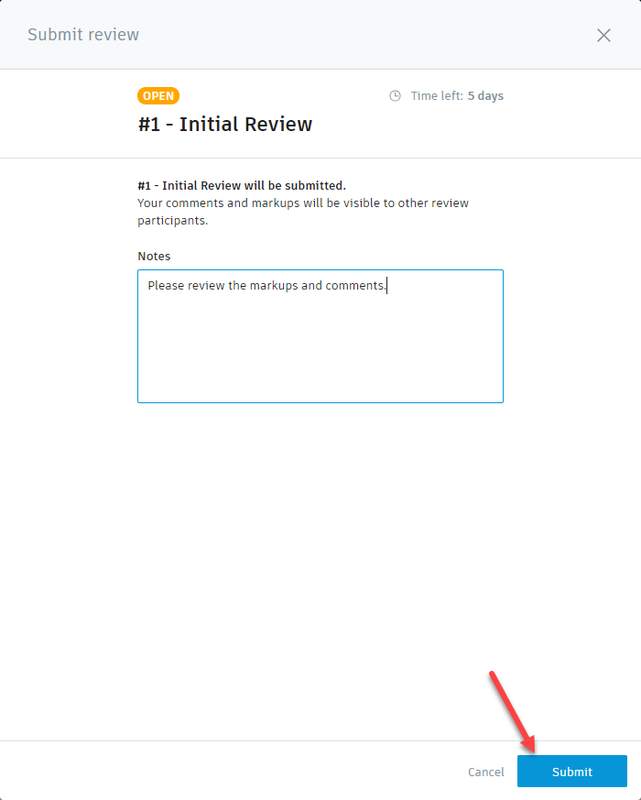 Submitting the final review will close the review and make the Markups and Comments visible to all review participants. From the standard Folders tab, the status of the documents is visible to all participants. 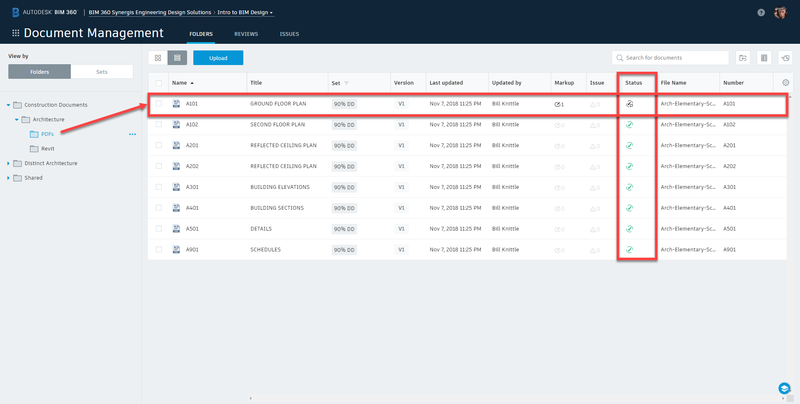 The visible Markups can foster the iterative nature of revising the documents which may give way to newer versions of the documents being published and reviewed. 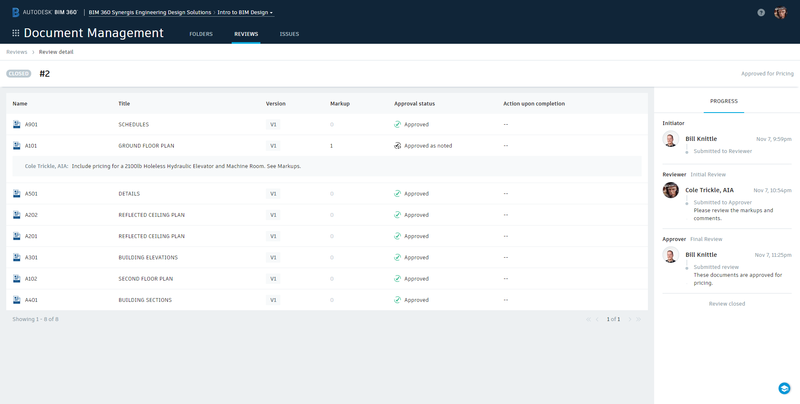 From the Reviews tab, participants can open the closed review to see any and all comments to the documents as well as, the individuals that participated in the process. Included is the notes they passed along to each other. 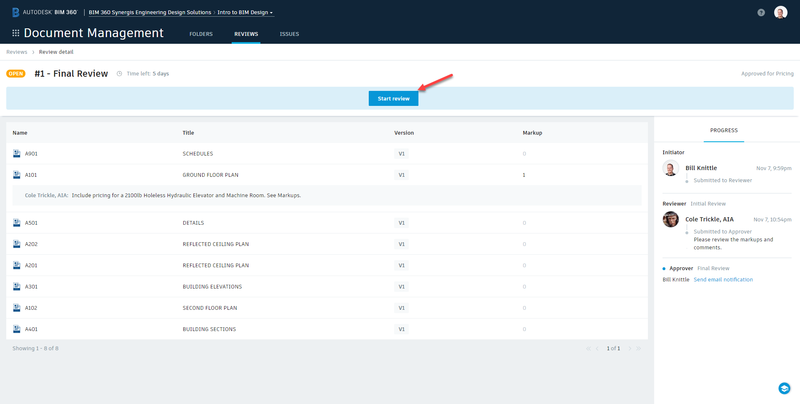 This new feature now gives project teams a more efficient design review process. Watch this workflow feature in action in our step-by-step tutorial below. 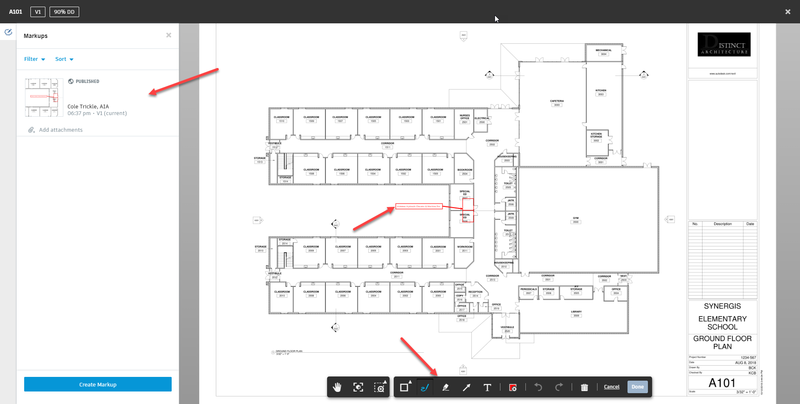 Want to learn how to leverage BIM 360 in more ways? 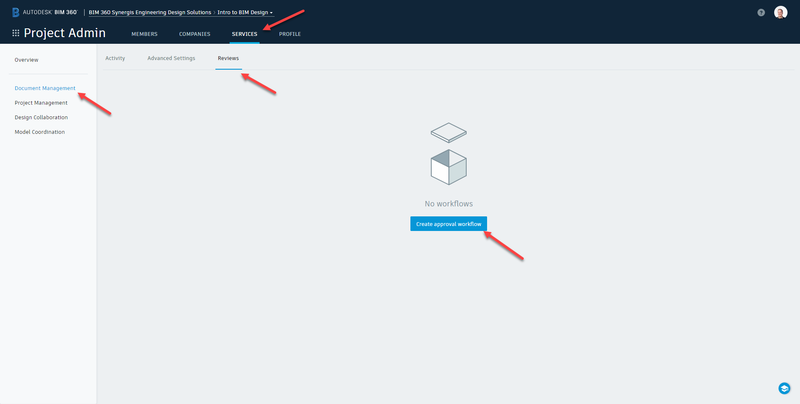 Learn about the Hypermodel Navigation update in Part 7 of our Next Gen BIM 360 series. Plus, check out the Next Gen of BIM 360 YouTube playlist or contact us with your questions.